CALM, the male mental health helpline that has been so successful in the north-west, is launching in London. The London CALMzone - CALM stands for Campaign Against Living Miserably - take over Top Man in Oxford Street on Friday 25 November 2011 with the help of some of the finest DJs in the UK. 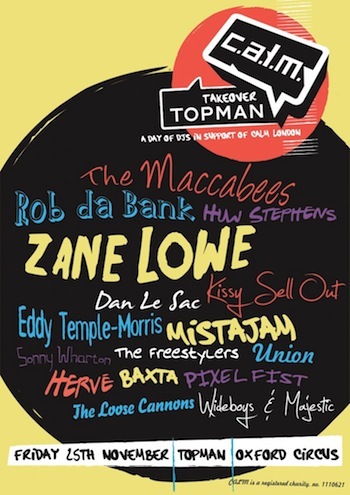 The free event runs from 12 noon to 8pm and features sets from Zane Lowe, Rob da Bank, The Maccabees, Huw Stephens, Eddy Temple-Morris and a host of phenomenal DJs throughout the day. There's more information on the event and, of course, on the work of CALM on their website. If you want help, start here: CALMzone talk. The Merseyside organisation also have a book out on the first ten years of CALM and are relaunching the CALMzine in London Topman stores.